Have you ever wondered what it would be like to disregard everything society has tried to teach you? Could you really give up on your career in search of adventure and a life that you want to live, rather than the one that has been laid out before you? This is a publication for dreamers. If you have ever thought about quitting your job and jumping into the world but never done it, this might just give you the push and confidence that you need. Using rational thinking, The Avant-Garde Life breaks down every possible barrier and encourages you to overcome them. This is about more than a single journey: this is a way of life. A happy, fulfilled life. 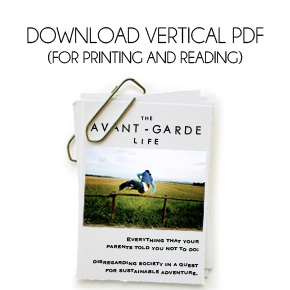 Download The Avant-Garde Life (2nd edition) by selecting your format below. It is free to download and share with others. Hopefully it will give you a kick up the bum. 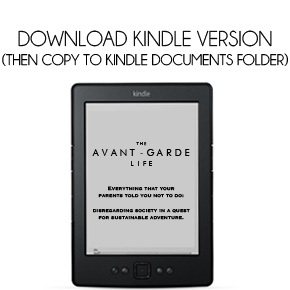 You can also download the ePub version (for non-kindle e-readers) by clicking here. When you download this as a pdf (under 1MB), the file will open and you will then have to save the file (File > Save). If you want this in any other formats, have a problem accessing the files, or notice any errors, please send me a message. When you’ve read it, please leave your comments below and share this page with others by using the share buttons at the bottom of the page. It only takes a second. Please also consider leaving a review on Amazon dot co dot UK or Amazon dot com to help promote it to a wider audience. It has been downloaded over 18,000 times (as of December 2016). This download is free. However, if you like it, you can support both this and future projects by making a donation via PayPal. You do not need a PayPal account to do this and it is offered on a “what it’s worth- what you’ve got” basis meaning that you can give as little or as much as you like. Any size of donation is greatly appreciated.